CONSTRUCTION WORKER CHEATED! REACH SG SALARY DROP 4 TIMES! You are at:Home»Caught In The Act»CONSTRUCTION WORKER CHEATED! REACH SG SALARY DROP 4 TIMES! This construction worker was initially told he would be paid $1600 but it was reduced to $452 when he arrived in Singapore. The employer insisted he sign a contract to agree to the reduction. Thankfully, he did not. Most workers are often too afraid of losing their jobs and would comply. At first, MOM dismissed his claim that he should be paid the promised amount when he sought assistance from them. After an appeal by migrant worker NGO HOME: Humanitarian Organisation for Migration Economics, it was accepted and he’s also been allowed to find a new employer. But he is facing much difficulty looking for one as most prospective employers and agents would demand money in return for a job. He paid approximately 5k to recruiters and is already deep in debt. If any of you out there is able to assist, do get in touch with HOME. 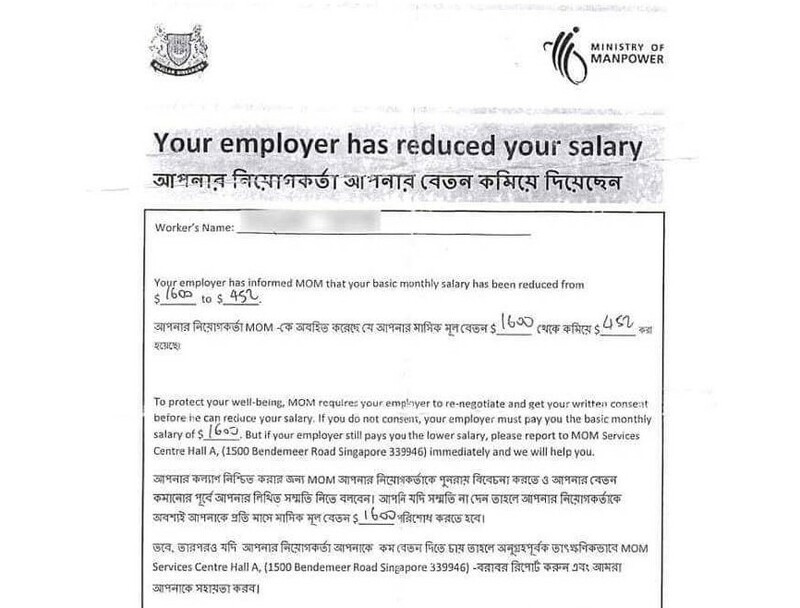 MOM needs to investigate this employer for deceiving the worker about his wages as false declaration is an offence. Not sure if that’s happening. It’s a good thing thatLouis Ng will be raising this in parliament. Previous ArticleMAN CAUGHT URINATING AT HDB VOID DECK!